The Wi-Fi router market has seen a yearly cadence of flagship releases since the first 802.11ac routers came into the market in early 2012. Starting with 3x3 solutions, the market moved on to 4x4 and MU-MIMO-enabled Wave 2 solutions. We also saw Broadcom taking the lead with a dual 5 GHz radio solution (that has now been adopted by Qualcomm Atheros also). Many networking equipment vendors introduced solutions based on this. The recent mesh networking craze is also an offshoot of this dual radio solution - a dedicated 'invisible' channel is used to link the satellite to the main router (a discussion for another day). At CES earlier this year, the TP-Link Talon announcement indicated that tri-band Wi-Fi was getting traction in the market. Tri-band Wi-Fi involves radios operating in 2.4 GHz (802.11n), 5 GHz (802.11ac) and 60 GHz (802.11ad) bands. 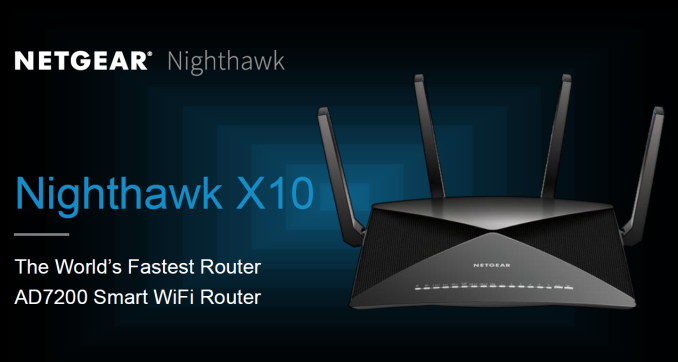 Today, Netgear is launching their first tri-band Wi-Fi solution - the flagship Nighthawk X10. It will be marketed as an AD7200-class router and will carry the R9000 model number. Similar to the other AD7200 routers in the market, the Nighthawk X10 adopts a dual band 4x4 802.11ac solution for (1733 Mbps + 800 Mbps) and a 1x1 802.11ad solution for 4600 Mbps to justify the AD7200 tag. There are currently two 802.11ad routers in the market, the Acelink BR-6774AD and the TP-LINK AD7200 (Talon). Both models are pure Qualcomm solutions (i.e, the radios, switches and network processor are all from Qualcomm). 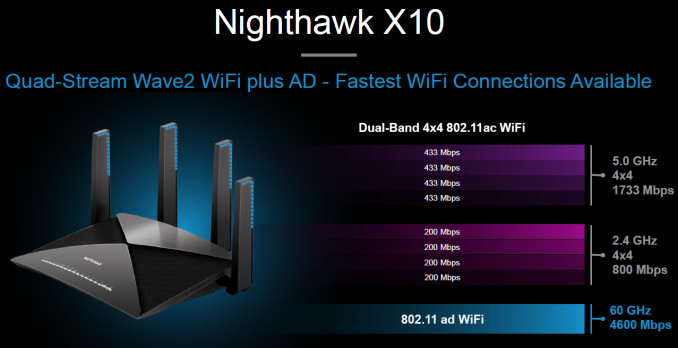 The Nighthawk X10 aims to differentiate itself from the existing solution by integrating first-to-market features - both in terms of hardware and software. It is the first consumer router to sport a 10G network interface, and it is the first router capable of running Plex with transcoding capabilities in a standalone manner. Qualcomm's IPQ solutions are pure network processors and do not have a video processing engine to enable the Plex capabilities that Netgear wanted to integrate in the Nighthawk X10. Therefore, Netgear decided to go with Qualcomm only for the radios (and, likely, the switches too). The network processing as well as the media capabilities are handled by a quad-core Annapurna Labs SoC running at 1.7 GHz. While Netgear didn't officially confirm the SoC model number, the specifications point to the Annapurna Labs AL-514 as the likely candidate (Update: Netgear informed us that the SoC is the Annapurna Labs AL-314 - which runs at 1.4 GHz in the Synology NAS units that adopt it). If this SoC sounds familiar to readers, it is the same as similar to the one we saw in the Synology DS2015xs, except that it has only one native 10G port. It has four Cortex-A15 cores running at 1.7 GHz and comes with multiple network interfaces (including native 10G capabilities). Netgear claims that the AL-514 is the fastest router processor available for the consumer market. The exact layout of the board (number of switches and the way the link aggregation-capable network interfaces are hooked up to the SoC) will be interesting to analyze once the R9000 is out in the open market. Netgear introduced their active antenna design (moving the TX power amplifiers from the board onto the detachable antennas) in the Nighthawk X8. In the X10, the RX power amplifiers are also moved out of the main board, further reducing noise concerns and improving robustness. In addition to the obvious bandwidth advantages, 802.11ad also brings about a significant reduction in latency compared to 802.11ac. The 60 GHz band is not subject to interference like the 2.4 GHz and even the 5 GHz band now. These aspects makes the technology ideal for a number of use-cases that were simply not a good fit for traditional Wi-Fi. VR gaming and 4K streaming are being promoted by Netgear as ideal applications for the Nighthawk X10. Unlike 802.11ac, where USB WLAN adapters were available for purchase when the first routers came into the market, the 802.11ad ecosystem is just getting started. There is an existing install base in terms of dedicated docking solutions, and Intel's newer vPro-enabled platforms have Wi-Gig support. However, it is not clear whether all existing Wi-Gig products in the market will be interoperable with the AD7200 routers. It must also be remembered that 802.11ad is a short-range line-of-sight technology - this means that the AD7200 routers can't be tucked away out of sight in a closet. The industrial design of the R9000 is similar to previous routers, and I am not entirely sure the market appreciates that in the living room (often cited as the reason for the attractively designed mesh routers becoming popular). The other strange feature is the 10G SFP+ fiber port. My market research revealed no consumer NAS models with that network interface. A 10G BASE-T port would have been nice, but, that increases the BOM cost. Consumers must note that the real-world performance of 802.11ad, like all other Wi-Fi technologies, is nowhere near the theoretical numbers. Under ideal conditions, real-world TCP throughputs of the order of 1.7 Gbps can be expected. Netgear is also aiming to simplify setup and operation of the unit with a new 'Netgear Up' router installation app for both iOS and Android. Various housekeeping tasks will also be supported in that app. In addition, the usual set of Nighthawk features such as ReadyCloud, OpenVPN etc. are also supported. The R9000 will also be supported by the My Open Router Netgear open source community. However, installation of the open source firmware will result in loss of value-add features such as Plex. 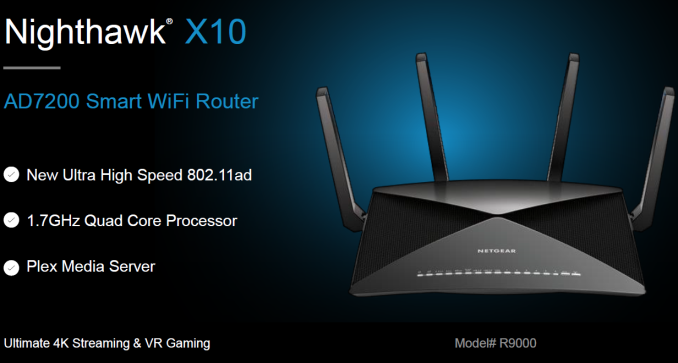 The Netgear R9000 Nighthawk X10 is now available for purchase in retail as well as e-tail stores for $500. Update: Netgear clarified that the R9000's 10G SFP+ port is compatible with a wide variety of transceivers (including direct-attached copper ones such as the Netgear AXC761). We were also provided with a list of tested / compatible transceivers (and they will go into a KB article on the Netgear site very soon). They are not even in the same league despite both being AD7200-class. The R9000 has the 10G SFP+ port vs. no 10G in the Talon (you have already mentioned this).